Shae Loya shrine is one of the mini-dungeons you can’t miss in Zelda Breath of the Wild. This is due to the fact it is located just next to the Tabatha Stable and the Tabatha Great Bridge to the west, just before you reach the Hebra area from Central Hyrule. There’s a cool puzzle inside, but there’s also a bug which keeps closing a certain door. In this guide, we’re going to help you finish Zelda BoTW Shae Loya shrine and get every chest inside. While inside the shrine, you’ll notice in the distance the ball being tossed in the air. The challenge is to make it go downhill and onto the switch. Stasis the ball while it is in the air and shoot it with arrows. They will change the direction of the ball, making it roll down onto the switch. 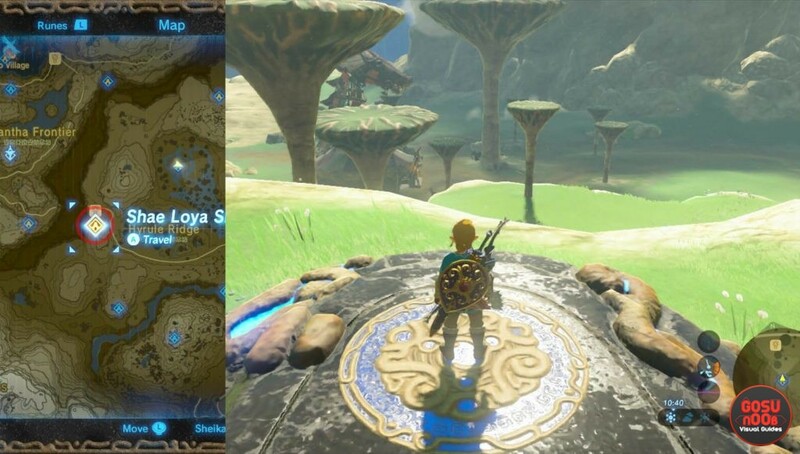 Once the ball is on the switch, it activates the platform at the shrine’s entrance. This platform serves the same purpose as the one under the ball. It propels anyone or anything standing on it into the air. Use it to reach the vicinity of the ball in front of you. There is a chest with a Topaz in that area. If you are up for it, you can eventually reach this area without the help of the propelling platform at the entrance. From the start, you just have to sprint, jump and glide. It takes a try or two, but you can climb up to the area with the ball using this method. This is how I’ve done it. Run, jump, glide and climb. One way to do it. The second treasure chest is high up in the air, right from where you enter the shrine. It is easy to miss due to its position. Use the arrows to shoot down two ropes that hold the balcony that the chest is on. You’ll find a Falcon Bow (20 damage) inside. You’ll need to loot it in order to get that chest icon next to the shrine’s name on the map. Once you’ve activated the propelling starting platform, step on it. Once in the air, look for the orange crystal. You have to shoot it down in order to open the gate to the Spirit Orb. Now, this is where the tricky part comes, the one that might feel like a bug and will cause the gate to keep closing. There are bows that shoot two or three arrows. If you have them equipped and shoot the orange crystal, it will count as if it was hit twice. This means it will open the gate, and close it shortly after. So, before you start wondering what is going on, be sure to have a single-shot bow equipped. Lokesh still remembers Purra, the cat from Aion, and how finding her and helping other players by spreading the information made him feel proud. Presenting precise and clear guidelines that readers can easily comprehend is the goal he strives for. That being the case, please excuse the numerous lists and tables in his articles.